Introduction to the agile approach and how it is related to Lean and systems thinking. Job Roles – are they needed in the future? Develop an organizational action plan for role modeling an agile mindset and to build new skills that will enable cross-functional teams. 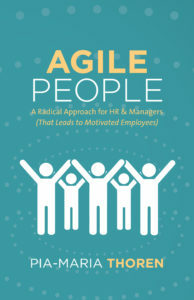 Why the agile mindset is an HR’s responsibility: Design the talent/people elements needed to help support an Agile transition in an organization and explain how different contexts can influence the approach to be taken. HR managers, HR Business Partners, HR professionals, line managers, operational and business managers and consulting managers in both the private and public sectors; Agile coaches; consultants. The course level is intermediate to advanced. Some professional experience in HR is recommended. An understanding of the Agile principles is useful but not strictly necessary. Your course leader and facilitator is Pia-Maria Thorén, who has 25 years of consultant experience from large Swedish and international companies within HR and leadership. She is the founder of GreenBullet and the author of the book “Agile People – A Radical Approach for HR and Managers (That Leads to Motivated Employees)”. Pia-Maria has previously trained participants from SKF, SE-banken, Marginalen Bank, Nordea, Volvo, TetraPak, Tele2, IFS, If, Svevia, Helsingborg, Uppsala, Manpower, Evry, TV4, Vitrolife, Rebtel, magine, Toca Boca, Dynabyte, Södertörn University, DEK Technologies, Vasakronan, IKEA, Blue Garden, Nordic Morning, Findwise and many other companies and organizations. the workshop ticket is € 800!! !